As progressive music again captures attention, it should come as no surprise that Australian bands are well in the thick of it. Venus is the latest album from Sydney four piece Hemina, and crystalises the sound that the group has been aiming for across previous releases. Rooted in the Dream Theater school of melodic progressive metal, Hemina make sure they add plenty of their own flourishes to stamp some individuality on their chosen style. Most predominately amongst these is the vocal diversity that Hemina displays. From mid-range cleans to some sweet high notes, they also mix some seriously effective growling tones, and on the back half Venus adds female vocals from bass player Jessica Martin that do more than just fill in the background. Musically, Hemina present playing with some serious chops: deft drumming from Nathan McMahon, some great jangly bass moves from Martin, particularly in “Starbreeze” where she truly shines, and plenty of extended, breathtaking guitar work courtesy of Doug Skene and Mitch Coull. They weave strong songs with stylish arrangements and pleasant surprises like the sax in the rather aptly titled “Expect the Unexpected” that also reappears later on the album. 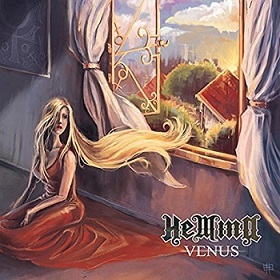 Like other prog bands, Hemina indulge themselves in some lengthy tracks that blows the playing time of Venus well past an hour, but unlike some others, this is a band clever enough to never over-indulge and lose focus, falling back on harmonised guitars or delicate melodies to keep the listener enthralled even across twelve minutes or so. This is a very good album indeed.